Heat oven to 425 degrees. Grease and flour rectangular baking dish, 13x9x2 inches. Beat baking mix, sugar, eggs, milk, syrup and 1/2 cup of the cheese with hand beater until smooth; pour into dish. Bake uncovered until wooden pick inserted in center comes out clean, 10 to 15 minutes. Sprinkle pancake with remaining cheese and the bacon. Bake uncovered until cheese is melted, 3 to 5 minutes longer. 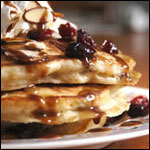 Serve with maple-flavored syrup if desired. 12 servings. High Altitude Directions (3500 to 6500 feet): Heat oven to 450 degrees. * You can replace the baking mix with 1 and 1/2 cup flour, 2 teaspoons baking powder, 3/4 teaspoon salt and 1 and 1/2 Tablespoons shortening. 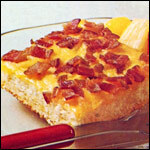 A savory cheese and bacon topped pancake with a touch of maple sweetness. This classic 1979 recipe if from a free booklet from Betty Crocker called "Home For The Holidays." 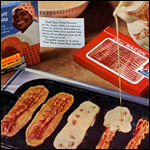 Copyright 1979 General Mills, Inc.
What do you think of Maple-Bacon Oven Pancake? This recipe has been a favorite for decades - I still have and cherish that leaflet of Holiday recipes. Thank you so much for posting the recipe - my sons loved this while they were growing up, it now is a favorite of their sons, and now became of your posting many more will love it. Thank you, again. Since we were kids, our mother made this every Christmas morning... and we've been making them for our children whom are now teens. :) Great family tradition. Excellent! I cooked and crumbled the bacon the night before I intended on serving. I also premixed and refrigerated the liquid ingredients. In the morning, I combined the liquid with the Bisquick and cheese for quick assembly. Fast & delicious and my guests loved it! 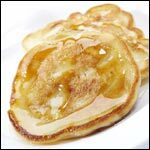 Can you freeze these Bisquick Maple Pancakes? Good because the bacon stays crispy, unlike other recipes where the bacon gets baked into it and gets chewy. Awesome! 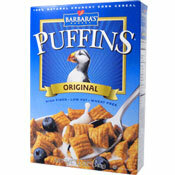 I've made this for breakfast a couple times now. Drizzling this with real maple syrup makes it delicious! Good pancakes... easy to make. 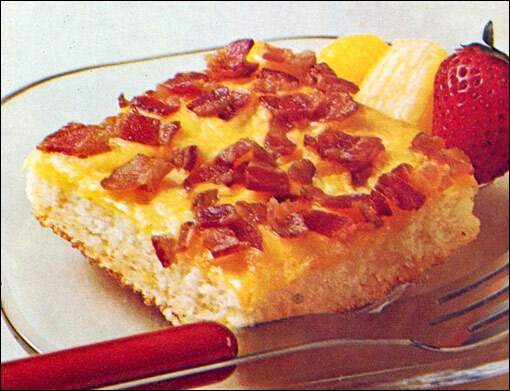 It combines my favorites: pancakes, bacon and cheese. My classmates loved them! Good and definitely interesting. But it feels more like a side dish... like eating a McGriddle without any egg. Tasty though. Thanks for the directions to make the baking mix. We were able to make this with ingredients on hand. We halved the recipe and made it in a 9x9 pan. It worked out pretty well.